The Nut-Free Mom Blog: Allergic Living Magazine--U.S. Version, Just Launched! 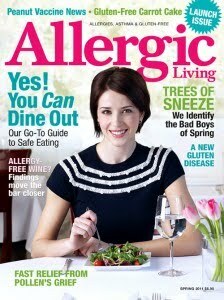 Allergic Living Magazine--U.S. Version, Just Launched! For those of you new to the world of food allergies and even to those of you who have been dealing with food allergies for awhile, I have to tell you about Allergic Living magazine. This amazing resource for people living with food allergies, environmental allergies and asthma, is chock-full information about all aspects of life with allergies. Unlike some other publications, it does not focus mainly on gluten-free living, but delves into life-threatening food allergies in greater detail than you'll find anywhere else. What's more, Allergic Living recently issued a U.S. edition (they are based in Canada) to deal directly with the many aspects of life with food allergies in the U.S.
Allergic Living's latest issue, the new U.S. edition, focuses on one of the toughest aspects of living with food allergies: dining out. With a feature article by Sloane Miller of Allergic Girl (the blog and the book), you'll find page after page of awesome advice and support, so don't miss out! This article also features tips from top chefs including Ming Tsai and Top Chef Masters' Susur Lee. In addition, you'll find new monthly columns from FAAN CEO Julia Bradsher and also a column from Gina Clowes of AllergyMoms. I had the pleasure of finally meeting Gwen Smith, editor of Allergic Living, (after e-mailing, Facebooking for months) at the recent FAAN conference in Chicago. (I'll post my conference recap later this week.) She is such a warm, bright and knowledgeable advocate for people living with food allergies and we had a great time chatting in between sessions. Gwen has food allergies herself so she knows what she's talking about! It's rare that I've found a resource as complete as Allergic Living so I just wanted to share it with all of you. I hope you'll check it out! Let me know!